Snuba divers swim for 30 minutes without coming up for air! This gigantic turtle was cruising along only 15 feet away from the boat! ...but the stars of the show here are the turtles! 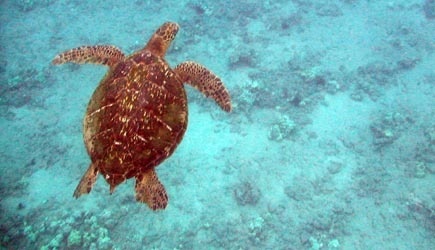 Aqua Adventures offers a two location snorkel tour (normally Molokini for the first stop and Turtle Arches for the second). Some Molokini boats hold upwards to 140 people … no such crowds on board Aqua Adventures Molokini … while the vessel can hold 49, they limit the trip to just 36 guests per day. The boat is FAST too! 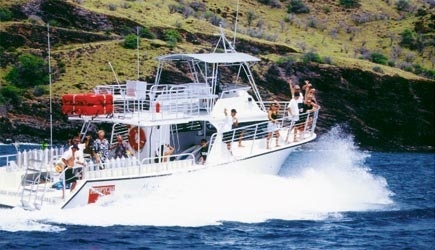 Powered by twin 350HP motors, this vessel cruises at 22 knots which means you’ll be waving goodbye to other boats as you pass them on the way to Molokini crater. Want to try something really adventurous? Take your snorkeling experience to a whole new level of underwater thrills with a SNUBA DIVE on board the 50 foot Aqua Adventures boat. SNUBA is much like scuba diving … you breathe compressed air through a regulator and can stay underwater for up to 30 minutes. But the snuba experience is a lot easier than a first-time introductory scuba dive because you don’t have to wear all the bulky gear. The tanks don’t go on your back … instead they float on a raft that stays at the surface of the water and a hose comes down to your regulator. As you move around underwater the raft follows you around effortlessly, leaving you free to explore and focus on the experience, rather than struggling with the gear. Your dive instructor will lead you on a guided tour of the underwater world. While SNUBA is Aqua Adventures’ specialty, this boat is great for those who are only going to snorkel too. It doesn’t matter if your party is ALL snorkelers, ALL snuba divers, or some of each. Those doing a snuba dive will have 30 minutes of underwater SNUBA time and another 30 minutes or so of snorkeling at one spot, and will have over an hour to snorkel at the other spot. Snorkelers who aren’t SNUBA diving will have about 3 hours of water time split between the two dive locations. Check In: 6:45am at Maalaea Harbor slip #51. This is the boat harbor in Central Maui just behind the Maui Ocean Center Aquarium along Highway 30. Tour includes: The basic snorkeler rate includes continental breakfast on the way to Molokini, a really nice “build your own sandwich” deli lunch after you are done in the water, and an open bar for beer, Mai Tais, rum and cokes, soda and juice. Gear Provided: The basic snorkeler rate includes snorkel gear and instruction, and two snorkel locations. Wet suits are available to rent onboard for a very modest fee of $5. Underwater cameras, T shirts, and souvenir boarding photos are also available for purchase. Restrictions: While children of all ages may go along to snorkel, the minimum age for snuba is 8. All snuba divers must fill out a health screening questionnaire before participation. Occasionally someone will be disqualified from participating in snuba and in those cases we will refund the snuba dive portion of the ticket cost and only charge the basic snorkeler rate. Note: Aqua Adventures often has an on-board videographer who will produce a DVD of your trip which is available for purchase. NCL cruise ship passengers in Kahului are able to do Aqua Adventures Molokini on their second day in port. There is a 12-15 minute cab ride to Maalaea Harbor, or we can arrange a rental car with free shuttle pick-up at the harbor; rates vary throughout the year but start around $40 per day in low season; see our rental car page for more information. Lahaina cruise ship passengers can do Aqua Adventures only on day 2 (assuming your ship is spending the previous night in Lahaina). This would require a 20-25 minute cab ride, or you can reserve a rental car. Molokini as a snorkel destination is somewhat weather-dependent. While all tours that advertise Molokini as a destination will make every effort to provide guests with the Molokini experience, a few days a year mother nature is in charge and the tours get diverted to an alternate snorkel site. Ultimately the decision is up to the captain of the respective vessel and that decision is always made with the safety and comfort of the guests in mind. Morning is typically a better time for snorkeling than the afternoon because the trade winds here in Hawaii are much lighter in the morning and the wind usually kicks up around noon or so. Many boats (and activity desks) advertise less expensive afternoon Molokini trips … we don’t find this approach to be an honest one. Because of stronger trade winds, most afternoon trips go to “Coral Gardens” which is near the tunnel along the Pali Highway between Maalaea and Lahaina. Coral Gardens is a nice spot to snorkel … but it isn’t Molokini. We do offer these afternoon trips, but we take the high road here at Adventuremaui.com … since your chances of going to Molokini in the afternoon are less than 20%, we prefer to market them as Coral Gardens snorkel tours … which occassionally get diverted to Molokini on really calm afternoons. If you want to be reasonably sure you are going to Molokini, you definitely want to book a morning trip when your chances of getting to Molokini are more like 95% instead of 20%.